Caption : Kochi,28/03/10. 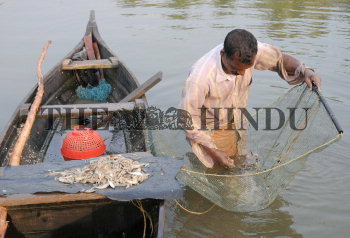 A fishrman in the backwaters of Kumbalanghi (Near Kochi) lands his catch, ever on the dwindling side as pollution, overfishing and climatic changes deplete fish resources in these scenic waters. Photo: H. Vibhu.